Fredericksburg, Va., September 8, 2016 — Today, ScoutComms, the nation’s leading communications, advocacy, and philanthropic strategy firm dedicated to providing services that support veterans and military families, was recognized by B the Change Media as a ‘Best for the World’ company for creating the most positive overall community impact. 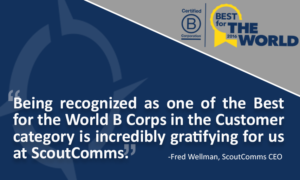 ScoutComms is honored in the Best for Customers category, which includes businesses that earned a Customer score in the top 10 percent of all global Certified B Corporations (B Corps) on the B Impact Assessment. This is the first year ScoutComms was eligible for recognition, after becoming a certified B Corporation in June 2015. “Being recognized as one of the Best for the World B Corps in the Customer category is incredibly gratifying for us at ScoutComms. We are one of the few B Corps where our social mission of supporting veterans and military families also happens to be our corporate focus. 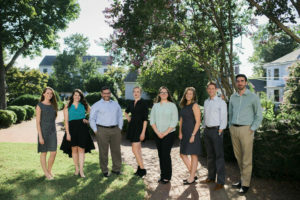 Every client we work with is focused singularly on helping the community we serve and that’s given us a unique ability to make a difference and make a living at the same time,” said Fred Wellman, founder and CEO of ScoutComms. Wellman is in attendance at today’s Best for the World award ceremonies, held at the University of California, Berkeley’s Haas Business School. The B Corp movement was launched in 2006 by B Lab, a nonprofit organization that serves a global movement of people using business as a force for good. Its vision is that one day all companies compete not only to be the best in the world, but the Best for the World, and as a result society will enjoy a more shared and durable prosperity. The existence of Certified B Corporations makes it easier to tell the difference between “good companies” and good marketing. The Customer category encompasses companies whose products or services are designed to solve a social or environmental issue. ScoutComms was recognized for its laser focus on providing services that support veterans and military families. Honorees scoring in the top 10 percent set a gold standard for the high impact that business as a force for good can make on employees around the world. The award is based on an independent, comprehensive assessment administered by B Lab. The full assessment measures a company’s impact on its workers, community, customers and environment. “The companies we are honoring as the best for the world represent the cutting edge of a global movement using business as a force for good. We are inspired by them, and feel deeply honored to join them in this historic and ground-breaking celebration,” said Bryan Welch, CEO of B the Change Media, the multiplatform media company that publishes the quarterly B Magazine and host of the Best for the World event at the University of California, Berkeley, on September 8, 2016. A total of 515 Certified B Corporations were named 2016 Best for the World Honorees, representing 35 countries, including Afghanistan, Kenya, Vietnam and Turkey. The selection criteria for Best for the World honorees are available on the Be the Change digital platform website. Honorees will be featured online and in the upcoming fall issue of B Magazine. Today there are more than 1,800 Certified B Corporations across over 120 industries and 42 countries, unified by one common goal: to redefine success in business. Any company can measure and manage its social and environmental performance at http://bimpactassessment.net. ScoutComms, a Certified B Corp and a Service Disabled Veteran Owned Small Business, is the nation’s leading communications, advocacy, and philanthropic strategy firm dedicated to providing services that support veterans, service members and military families. We work with Fortune 500 corporations, veteran-owned businesses, non-profits, and other organizations to help them increase and sustain their positive impact for those who have served. Our mission is to empower veterans and military families through communications grounded initiatives and collaborative partnerships that lead to greater awareness of veterans’ needs and expands their access to resources promoting their economic, physical and mental well-being. ScoutComms is one of the first B Corps in the world focused on veteran and military community issues. Please visit our web site at www.ScoutCommsUSA.com. Follow us on Twitter and Facebook. B the Change Media was formed as a partnership between B Lab, the community of B Corporations, and Bryan Welch, former CEO of Ogden Publications (B Corp since 2010). B the Change Media is a multiplatform media company whose mission is to build the world’s largest engaged audience of people with a passion for using business as a force for good. B the Change Media has editorial and operating independence and covers compelling stories about business as a force for good, not just stories about B Corporations. B the Change Media has independent investors and is a subsidiary of B Lab, the nonprofit organization that administers the Impact Assessment and aggregates the B Corporation community. B the Change Media is a Pending B Corporation. For more information, visit http://www.bthechange.com. B Lab drives this systemic change by: 1) building a community of Certified B Corporations to make it easier for all of us to tell the difference between “good companies” and good marketing; 2) passing benefit corporation legislation to give business leaders the freedom to create value for society as well as shareholders; 3) helping businesses measure, compare and improve their social and environmental performance with the free B Impact Assessment; 4) driving capital to impact investments through use of its B Analytics and GIIRS Ratings platform. For more information, visit www.bcorporation.net.